Measure H, the “Los Angeles County Plan to Prevent and Combat Homelessness” is the March 7 ballot measure that is focused on homeless prevention, provide comprehensive supportive services and support long term solutions like permanent housing. The homeless youth community’s involvement in advocacy and mobilization is critical to South Los Angeles. 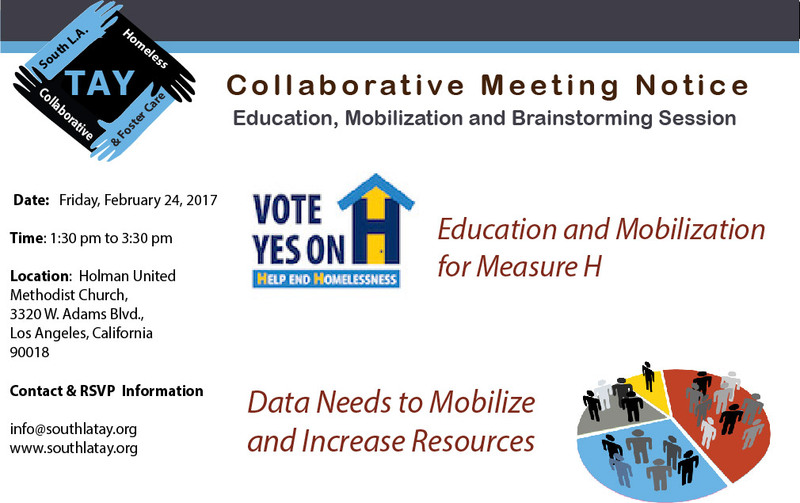 The Collaborative supports Measure H and at this meeting we will discuss a mobilization strategy targeting the week before voters go to the pools. We just completed the 2017 Homeless Youth Count with many organizations and individuals that participated in the process. Homelessness among youth in South L.A. is not well captured or understood. Beyond the annual youth count, more data and research is needed to better represent the needs of South L.A. Our goal to mobilize others and increase funding opportunities for South L.A. is essential as new resources are being made available in the Los Angeles region. We will have a discussion and brainstorming session about data needs focused on youth homelessness in South L.A.